Frank Lloyd Gallery artists have been very busy, so here’s a round-up of their latest activities. 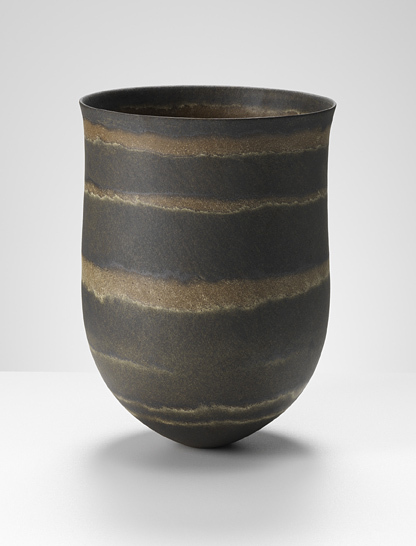 To begin, Jennifer Lee has been invited to participate in the International Ceramic Festival in Sasama, Shizuoka, Japan. During the festival, November 22 – November 24, 2013, Lee will present a slide lecture and practical demonstration. Gustavo Pérez will join her at the festival, as he is also scheduled to speak to participants. In 2014, Lee will return to Japan for a two-month artist’s residency at the Shigaraki Ceramic Cultural Park. An important work by Craig Kauffman is now on display at the Barbican Art Centre, as part of their exhibition Pop Art Design, which opened on October 22 and will run through February 9, 2014. I was fortunate enough to preview this show during my recent trip to London. Pop Art Design investigates the “exciting exchange of ideas between the fields of design and art” during the Pop Art movement. Peter Voulkos is currently the subject of a one-man exhibition at the Franklin Parrasch Gallery titled Peter Voulkos: Works, 1956 – 1997. On view through November 23, 2013, this show features ten ceramic artworks drawn from distinct periods within the artist’s long career. I’ve just returned from London, a true crossroads of the world (to say the least) and a center for global markets of finance, commerce—and art. Like many visitors, I strolled parks and avenues, walked along the Thames, and took in several museums—from the National Gallery to the Tate Modern and the Tate Britain. Like many others involved with contemporary art, I attended Frieze and Frieze Masters. I also went to London galleries. Collecting art, which was once the pursuit of a smaller population of people and a smaller number of museums, has become far more common. The exponential expansion of the art market, due to the broad digital distribution of images and information, as well as concentrations of wealth in emerging economies, has led to a true change in the way that people see and acquire art. Globalization of art (and all kinds of related information) has drawn many new people who may not have the same objectives as the traditional collector. The art fair is now a primary source for them. Last summer, I posted a video featuring Scot Heywood talking about his work and career, produced by the gallery for his show Polarities. It seems like a good time to re-post that video, as Scot Heywood is the subject of two complementary solo exhibitions this fall. Scot Heywood: A Survey of Large Paintings 2006-2013 opened last Saturday, October 19th, at the Pete and Susan Barrett Gallery at Santa Monica City College. Here at the gallery, we’ll be opening our own exhibition of Heywood’s work, titled Scot Heywood: A Survey of Small Paintings, this Saturday, October 26th, from 5:00 – 7:00 pm. 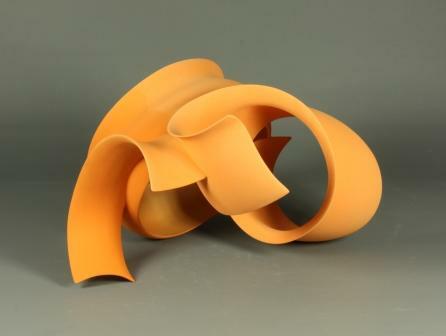 The gallery’s current exhibition, Translucence, will be on display through October 19th. It’s best to see it in person. Presenting works by Larry Bell, Robert Irwin, Craig Kauffman, Helen Pashgian, and DeWain Valentine, the show explores the perceptual effects these artists achieved through their use of mediums such as acrylic plastic, epoxy, cast resin, and glass. We produced a video walk-through for Translucence, in case you won’t be able to make it to the gallery. Shot and edited by Oliver Bell, the video beautifully illustrates the atmospheric nature of the works. Now that I have works on display by DeWain Valentine in our current exhibition, Translucence, I have been thinking a lot about another show of his – From Start to Finish: DeWain Valentine’s Gray Column – on display at the Getty from late 2011 through early 2012. Organized by the Getty Conservation Institute as part of the Pacific Standard Time Initiative, From Start to Finish told the story of the Gray Column’s production, original installation, and subsequent conservation. This monumental work, cast in polyester resin, was commissioned by Baxter Travenol Laboratories as part of a two-piece installation of columns, each 12 feet high, for their Illinois headquarters. However, a change in architectural plans made it necessary for the works to be displayed horizontally, as Two Gray Walls. It wasn’t until the Getty’s 2011-2012 exhibition that the artwork was installed vertically, as Valentine had always intended. 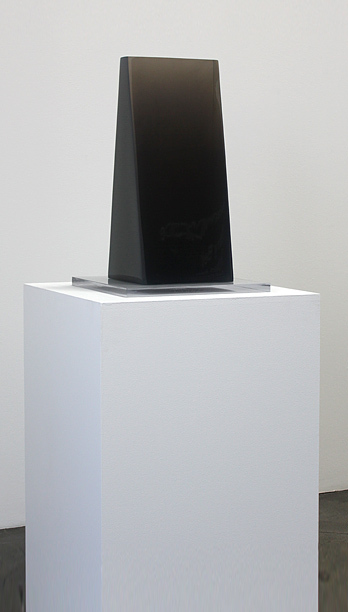 A related work by Valentine, called Column Gray, 1972-75, is on view at the gallery now. After noting the strong relationship between Column Gray and the larger Gray Column, I did a little research into the background of the two pieces and found out that Column Gray is actually a color study for its large-scale twin. Before Valentine began work on the full-size Gray Columns, he produced a series of maquettes, in order to experiment with various levels of pigmentation and opacity. Standing at just under two feet tall, Column Gray is one of these maquettes, demonstrating a slightly darker color palette and a more opaque base.